And a close up of those fun little blooms! The background is PTI's Sheet Music stamped in Fresh Snow! I just love that set! Then of course the die is the doily from PTI! So that is it for today! 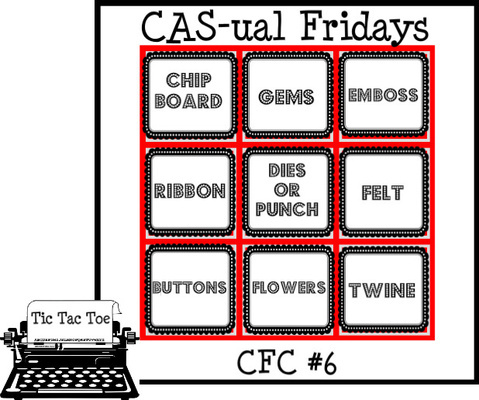 Stop by the CAS-ual blog for the Sponsor and prize deets! OH and don't forget to check out the CAS DT projects! There cards are going to be FUN! I can't wait to see what everyone's Tic Tac Toe looks like! This is such a fun challenge :) and your card is lovely. The soft touch of the music note background is perfect! Ahh! So so fun Laurie! Love this idea and your card is sooo lovely! Such a pretty card -- I just wish it were Friday already! What a lovely beautiful and pretty card, yep, I think I have the adjectives covered! I've been trying to view this post since yesterday but for some reason it kept saying the post didn't exist! So glad I tried again this morning...love your card. Love the color combo, Laurie. So very pretty!! Very pretty card. I love that music background--just the right touch. I'm going to hope right over to Cas-ual Fridays and play along. very pretty! The doily die cut looks awesome! So gorgeous, Laurie! I love it! Gorgeous, as usual, Laurie! Utterly feminine and yet completely CAS! This is gorgeous! So pretty!! I love those flowers! We do love them don't we? hehe Beautiful card! This is so lovely Laurie! What a gorgeous card and those colors ROCK! So very pretty! Your card is SO sweet! Love the doily, ribbon, music background, flowers and sweet pearls! I'm loving this new challenge blog you are a part of! You are perfect for it! Oh my, this card is so simple and so gorgeous. I love it! This, too, is GORGEOUS! And I almost didn't notice the sheet music, too! LOVE that yummy bow and the doily! Laurie, you are so talented! IMHO, this is the PERFECT sympathy card. Or thinking of you...*grin* Simple, beautiful and touching. 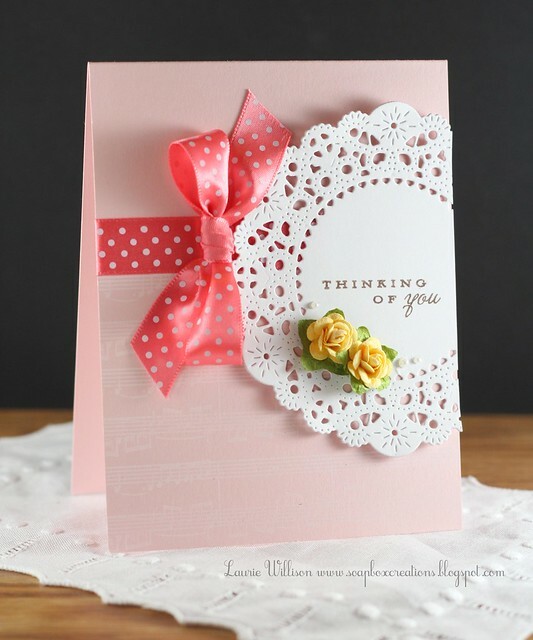 So sweet and delicate, Laurie! 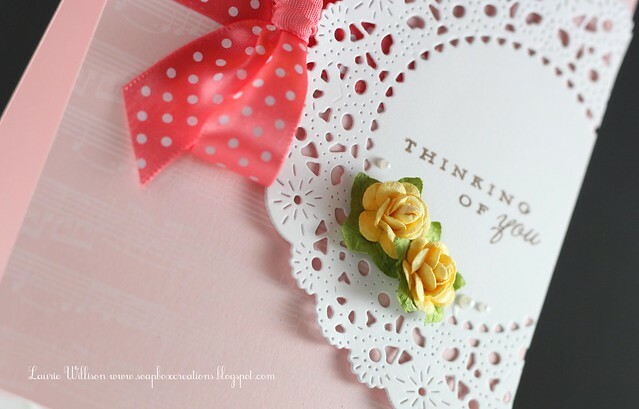 I adore that doily and the polka dot ribbon - such a beautiful pop of color on that subtle card base. Delicious!